Delegates to an international fact-finding and solidarity mission were harassed this morning at Bancasi Airport in Butuan City. The delegates, composed of lawmakers and representatives from peasant and human rights groups, arrived from Manila to participate in the three-day activity which aims to investigate peasant killings and other human rights violations under martial law in Mindanao. Upon arrival at the airport, the participants noticed a banner welcoming them to the activity, with the words “Just do it right” printed at the bottom. Sensing something suspicious, they asked if any of the registered delegates brought the said banner. It was later found out that the banner did not belong to any delegate or group participating in the mission. Reports from Cagayan de Oro said that the same banner was posted at Lumbia Airport. On the way to Cagayan de Oro, mission delegates coming from Lumbia Airport were held at checkpoints in Brgy. Molugan, El Salvador; Brgy. Luyong, Opol; and Brgy. Igpot, Opol in Misamis Oriental. Kabataan Partylist also reported that several men in civilian wear took photos and videos of the participants as they were leaving the airport. Organizers confirmed that they were not part of the official delegation. Participants also raised suspicion over a black pickup truck that tailed their vehicle from the airport to the highway. Kabataan Partylist representative Sarah Elago condemns the intimidation that greeted the delegates. “We will not be cowed by any attempt to frustrate the significant cause of the IFFSM—that is to ferret out the truth on the extent of state-sponsored killings and other human rights abuses, particularly against farmers, in a huge step closer to bringing perpetrators to justice, and ending impunity,” she said in a Facebook post. Delegates to a previous solidarity mission were also met with harassment in February this year. 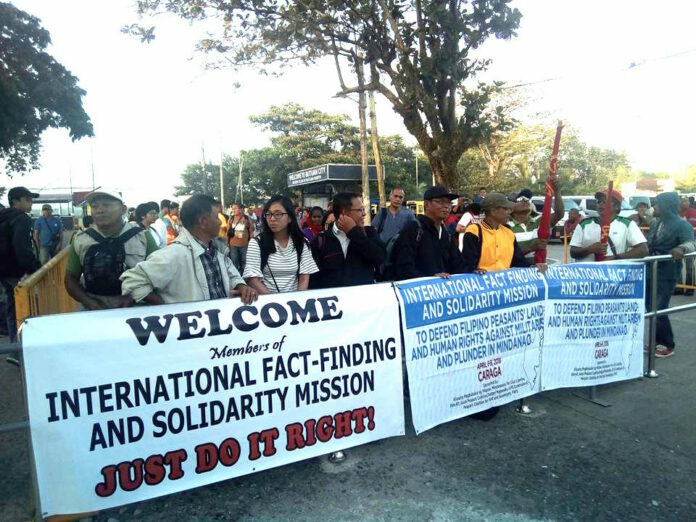 Foreign participants to the International Solidarity Mission were stopped at a checkpoint on the way to General Santos City and brought to the local Bureau of Immigration where they were interrogated for two hours. Military men also took pictures and videos of the delegates. The mission was organized by Mindanaoans for Civil Liberties and ICHRP (International Coalition for Human Rights in the Philippines). Rights group Karapatan notes that 80 out of 126 (or 63 percent) of political killings in 2017 were cases in Mindanao. The group has recorded 9 killings in Northern Mindanao; 10 in Caraga, 13 in SoCSKSargen; 28 in Southern Mindanao; and 10 in the ARMM. Majority of the victims are peasants and members of indigenous groups. Under the government’s counterinsurgency program Oplan Kapayapaan, military and paramilitary groups often label the victims as New People’s Army sympathizers. The international fact-finding and solidarity mission aims to conduct interviews, group discussions, and other activities to gather more information on peasant killings in Mindanao. It will cover three key regions: Northern Mindanao, Southern Mindanao, and Caraga. The mission is organized by Kilusang Magbubukid ng Pilipinas (KMP), Mindanao for Civil Liberties, Tanggol Magsasaka, Asian Peasant Coalition (APC), PAN Asia Pacific (PANAP), People’s Coalition for Food Sovereignty (PCFS), Rural Missionaries of the Philippines (RMP), International League of Peoples Struggles (ILPS) Commission 6 and the Youth for Food Sovereignty (YFS).probe killings and rights’ violations kicks off today in Northern Mindanao, Southern Mindanao and CARAGA regions.